The Oglala Lakota American Indians already struggle on the reservation with high rates of poverty and unemployment. The partial government shutdown is making it worse. A Gilpin County resident last week organized a drive to gather food and other basic items to assist the Oglala Lakota American Indians, who she said are struggling due to the partial government shutdown. About 800,000 federal workers in the U.S. are going without pay as lawmakers in Washington, D.C. remain gridlocked over President Donald Trump's demand for a barrier along the country's southwestern border. Laura Richards had no connections to the tribe before, but when she got a call from someone explaining how the shutdown was affecting them, she said she had no choice but to act. "We are better this," Richards said. "Colorado is better than this, and we can fix this." In the United States, there are 573 federally-recognized tribes that rely on federal money for basic needs like food and healthcare. That money comes through the Bureau of Indian Affairs, which is only operating with essential employees during the partial government shutdown - the longest one in American history. 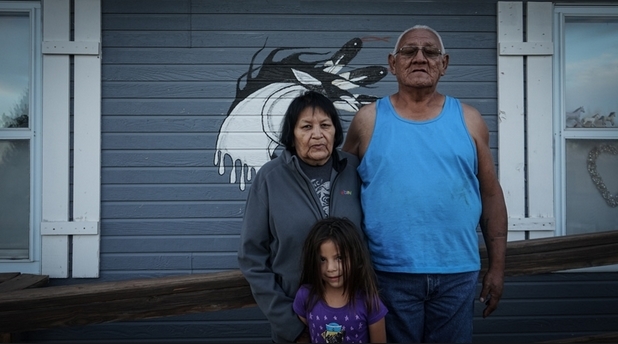 “People going hungry," said Ricky Gray Grass, a tribal leader about his biggest concern if the shutdown continues. "People going without propane and electricity, and people going without food." This means the more than 1.9 million Native Americans who live on reservations are going without the basic necessities promised to them through federal statutes and treaties. The Pine Ridge Reservation in South Dakota, where around 40,000 Oglala Lakota American Indians live, is six hours away. “We have a hard time getting assistance in our own state," Gray Grass said. Half of the Oglala Lakota Nation below the poverty line and around 80 percent are unemployed, but many of the people who do work are federal employees going without paychecks. “Everything is under a treaty obligation from the government," Gray Grass said. "With the shutdown, we lost everything. So this month is the last month for any services that is provided by the government." He says they are no longer getting commodities delivered, and people who live on the reservation are going without food, toiletries and medicine. "It made me very, very angry," Richards said. "And if our government is not going to meet our treaty obligations with the tribal nations in particular -- Pine Ridge and the Lakota Nation -- then it is our responsibility because our ancestors made us responsible for these treaties and it is our obligation to make sure our debts are paid." Richards packed pounds of food into her truck along with other basic necessities last week, and Gray Grass and another tribal leader came to Denver on Wednesday to pick up a second round of supplies. "A woman took a block of cheddar cheese and you would have thought it was gold," Richards said when she delivered the first truck load. Responses to "Woman gathers loads of donations for Native American tribe struggling in govt. shutdown"
The first thing the Native Americans should enact is that during any shutdown their funds (to all employees as well) can never be affected. This is really sad. Thanks to the people (this woman) and all the others who are helping those affected by Trumps shutdown.